2D, exploration, RPG and combat are among my favorite words to describe a particular game. They are usually reserved for Metroidvanias, which rank highly amongst my favorite video game genres. As someone who tried to keep up with the weekly eshop releases, I quickly found myself overwhelmed by the amount of new releases, but I try to keep up with Metroidvanias nonetheless. This week that spot is reserved for Dust, a game which I remember received high praise a couple of years ago, and it’s finally my turn to dip into some of Dust’s magic. 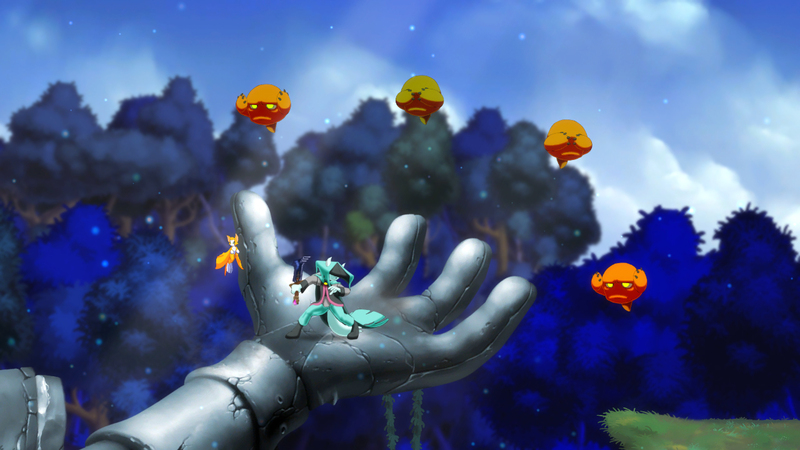 Dust: An Elysian Tail is a 2D action game that is sometimes a 2D beat ’em up, other times a Metroidvania. You play as Dust, a swordsman who lost his memory and travels alongside his talking sword Ahrah and flying nimbat friend Fidget. If I had to pick a similar game to describe it, I would say Castlevania Order of Ecclesia is a very accurate comparison. 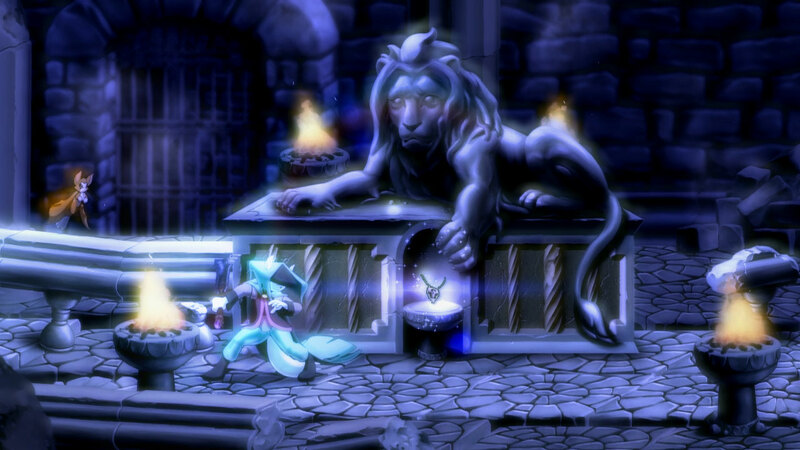 To expand upon the Order of Ecclesia comparison, Dust takes place in several levels. These levels allow for some degree of exploration. While you usually are free to go from A to B to complete your main quest, you are also encouraged to stray from the given path and find secrets scattered throughout the map. Not all of them will be accessible. Some of them will be only accessible once you acquire a power-up to improve your abilities such as sliding to go through small passages. Others are locked behind resonance gem walls which act as a lock and key system where a colored resonance gem will open every gate with the same color. If exploration is one half of the game, the other half is reserved to the combat aspects. Rather than being a slow and methodic 1v1 sort of combat, Dust features a 1vMany approach. To say it in a different way, most enemies are complete pushovers and pose no threat of their own, but their strength comes from numbers, and a mob can surely chip away your life if you aren’t careful about it. A lot of your combat success will be dependent on your strategy and awareness of their ranks, as opposed to intricate combat systems. In fact, combat is kept as simple as possible. You can press Y to do a sword attack and X at certain points in the chain to do a finisher. Press X on its own and you will do a dust storm, which is a weak multi-hit attack on the ground, and a mobility spiral in the air. The true strength from the dust storm shows when you combine it with Fidget’s A magic attack. 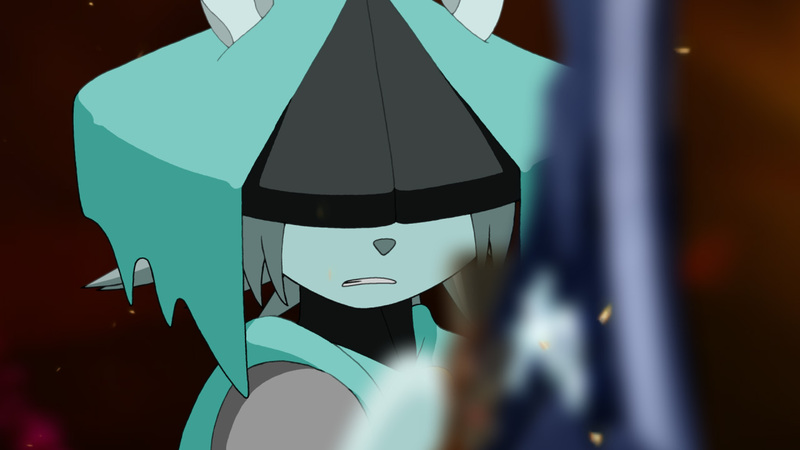 Fidget’s attack is weak on its own as well, but when it is vacuumed into the dust storm it becomes a powerful area attack. Unfortunately, mob fighting gets old pretty quickly. One of the main flaws of the game in my opinion is that enemies respawn when you re-enter a screen. This doesn’t sound bad by itself, but in a game that includes a lot of exploration elements, you can quickly see how fast fighting the same group of enemies gets old. To be fair, the enemies serve as a way to pseudo auto-correct your trajectory when dust storming though the air, so at least they are good for travel. Another issue I found with the mobs is that they don’t stand out nearly enough. If you reached the graveyard level, you will probably find yourself constantly thinking the enemies are all dead, only to find a zombie in an awkward position that refused to die and escaped your gaze. I wish I could say this was a one-of deal, but you will frequently find that the enemies don’t stand out enough from the backgrounds. It’s kind of funny, because on my playthrough I found that most of my deaths were due to me getting hit by a straggling enemy. I actually gave it a thought to find out why this happened to me in this game and not in any other, and the conclusion I arrived to was that the enemy attacks don’t feel impactful. Think about a game like Dead Cells and how every enemy adopts a very telling aggressive stance before they attack you. 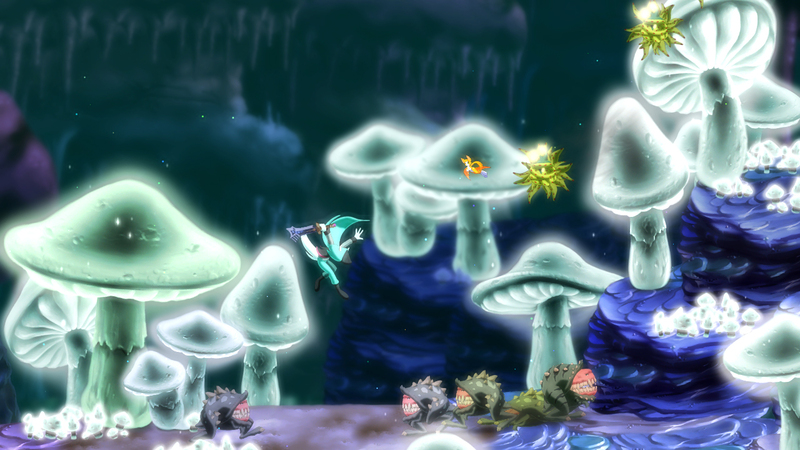 In Dust, the enemies and their attack animations are pretty dull, which fail to capture the player’s attention. Oddly enough, I think a quick solution for this would be to trigger some sort of rumble feedback after receiving damage. The game does feature some pretty good rumble action in a lot of places, so it baffles me that it was omitted for combat purposes. I’ve talked enough about the combat without mentioning one of its main purposes, and that is to gain experience and level up. When you level up, you can allocate a gem to any of 4 stats which are your HP, Attack, Defense or Fidget. The first 3 are pretty self explanatory, and the Fidget stat just refers to the strength of Fidget’s magic attacks which are done by pressing A and augmented by using the dust storm. After so many hours playing Dark Souls, I can appreciate the simpleness of Dust’s stats. I do wish the game got rid of the “your highest stat can’t be more than 4 points higher than your lowest”. I believe that was implemented to keep the player’s stat allocation balanced, but I found it restrictive when trying to play as a pure caster or perhaps as a tank. Before continuing, I’d like to mention that I chose Tough as the difficulty of my playthrough. I usually opt for higher difficulties because I consider most modern games are much easier than they should be, and for this game I’m glad I chose it that way because the game does tend to be on the easier side. Another reason is that I feel the challenge of the higher difficulties is better at exposing the flaws of a game. Can’t be mad if you are always on your honeymoon phase. Disclaimer: I am not married and haven’t been to a honey moon, so your mileage may vary. I did felt that the HP stat was pretty pointless on the higher levels. Healing is not precisely hard to come by, but as you progress your HP amount exceed the amount of healing you could get from your items without having to invest your fortune into healing food. I found it disappointing that there were no places to restore your HP like inns, and save points only restore what felt like 25% of your HP at max. This threshold is tied to the difficulty level, so chances are that if you opt for normal difficulty, the amount of HP you regen from save points will increase. I did find out that there is a system that prevents you from being one-shot, which reduces your HP to 1 if you took a fatal blow when >25% HP. I just went through the game investing as little as possible in HP, and kept my HP higher than 25% at all times. It felt a little like cheesing the game, but the amount of damage the enemies put with single hits is simply staggering, and I’d be a fool to try and top off my HP every time I got hit. One of the things that impressed me the most is just how smooth the storytelling is in this game. The pacing of the dialogue, coupled with the great voice acting and the auto-advance feature of the text makes for a story that is very easy to follow and even easier to be absorbed by it. Dust manages to be one of those few games where you can actually put down the console and let the story take over, as you enjoy it. There are many pitfalls when it comes to storytelling. Some games feature homogenous dialogue boxes which difficult it to attribute any particular sentence to a character. Other games like Octopath Traveler feature awkward pauses between the banter, like when someone says something and then there is a 5-7 second break before the next dialogue because the character walked two tiles to the left and apparently sighed. Some other games have clearly cut speech due to a given voice clip only saying as much text as it could fit on the dialogue box, which causes pauses in what could otherwise be a coherent sentence. There were so many ways dialogue could have gone wrong, and yet Dust rose above them all. A very welcoming aspect of the games comes from its sound. From the moment I first boot up the game, I heard sound effects very reminiscing of the SNES era RPGs. Perhaps this opinion is driven by nostalgia, but nonetheless I feel that they fit perfectly with the mood of the game. The music was pretty good too. I’d say it felt like the kind of music you hear when going to the Cirque Du Soleil in the sense that it has this epic feeling, but at the same time it has a clear nature-inspired mood. Overall I think Dust is a very recommendable game. The art style might put some people off, but the gameplay is pretty good and never feels overwhelming. A common issue with Metroidvanias is that they throw so much at you with many places they expect you to remember for your backtracking needs, but Dust keeps it simple but certainly not easy. I would definitely put this game in my list of recommendations from my personal stand point.